Needing an escape on this beautiful Friday? Let me introduce you to Casa Cook, an ultra cool resort that blends urban and beach effortlessly. So lately, I’ve been seeing a lot of people reposting images from luxury resort – Casa Cook, Rhodes. First off, I was like where’s Rhodes? I had no clue, so I googled it and turns out its the name of both a city and an island in Greece. Obviously I should have taken geography in school. Next I had to check out Casa Cook’s website for a little looky, and oh my goodness, this place is insane! It’s pared-back luxury at its finest. A little bit boho, a little bit coastal, with a good dose of contemporary thrown into the mix – and voila – it’s a recipe for success. Some of the rooms even have private verandas complete with sunbeds adjoining the resort’s pool so essentially you can swim up to your room (see picture below). Umm, where do I book in? Sign me up! 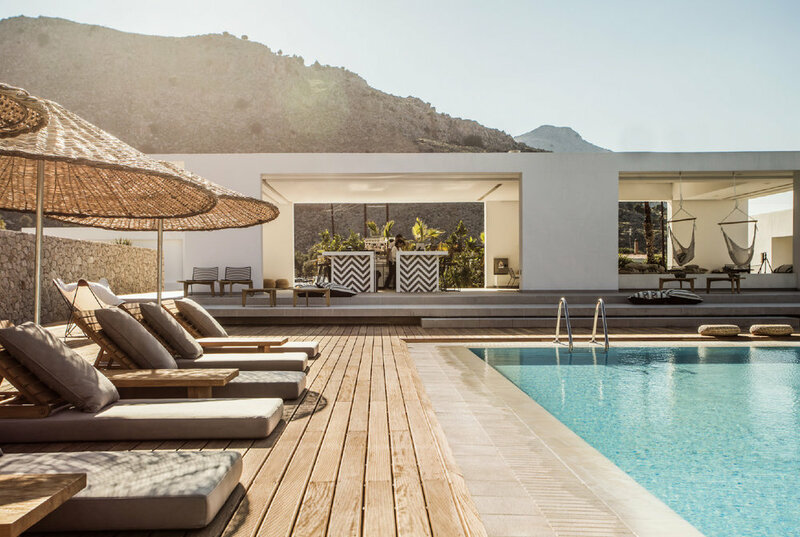 This wording on their website perfectly sums it up: Created for trend-conscious travellers, the 90-room adults-only Casa Cook Rhodes has an atmosphere that’s a blend of urban and beach, the style and attitude is its very own. There’s not a lot of travel destinations that get me as excited as Palm Springs (I know, I know, enough already about Palm Springs my friends say), but let me tell you this, Rhodes has me seriously tempted. The desert-like landscape is quite similar (as you can see above) but with the added bonus of being by the sea. You can check out more of this amazing resort by clicking here.